Let yourself go, The Adventure is Here! One hour of food type BUFFET WITH BEVERAGES included. Transportation back and forth from the Lobby of your Hotel or meeting point. Entrance to the Ruins of TULUM and COBA with Certificated Guide. Time to swim in a MAYAN CENOTE. Free time in Playa del Carmen. TULUM, the only Mayan ruins located in front of the beautiful Caribbean Sea, with impressive landscapes worthy of being visited and admired. Also cool off in the cold water of the CENOTE and visit PLAYA DEL CARMEN, where 5th Avenue is the heart of this city, you will find restaurants, jewelry stores, art galleries and much more. ! 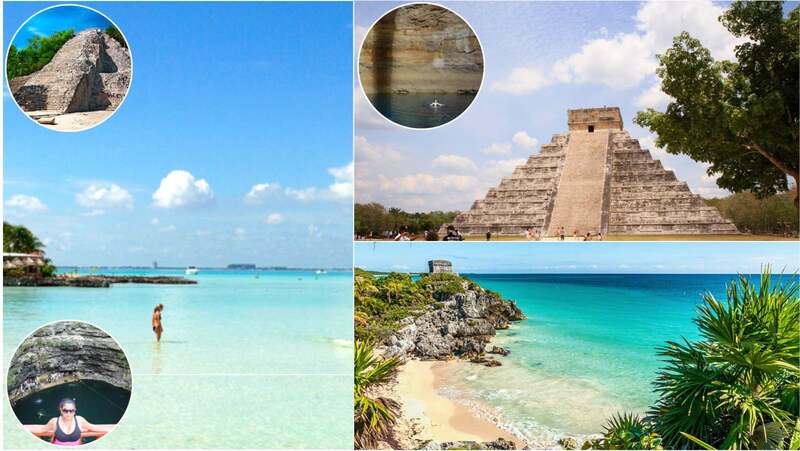 CHICHEN ITZA, one of the seven wonders of the world full of much history, through its buildings you will travel to the past and you will be amazed with the beauty of this place. ISLA MUJERES was a center of pilgrimage, mainly for the women who came to venerate Ixchel, the goddess of the moon, of fertility and childbirth. Isla Mujeres is not a product of the imagination, it is a dream come true. Drinks during the Buffet and tour meal. You can Book the Tours separately: Chichen Itza Economic from Cancun | Isla Mujeres Basic | Tulum, Coba, Cenote and Playa del Carmen. Once the payment of your reservation is made, you will be contacted to indicate the dates of each tour. This combo / package does not accept change of dates and cancellations. $ 148.00 Juniors 3 - 9 Years.